This long, hot summer has certainly been one to remember. But while many of us have enjoyed the sunshine, the soaring temperatures have had a critical effect on air quality, particularly in urban areas. In London and some other UK cities, pollution warnings were issued during the July heatwave. Air pollution in Europe is a bigger killer than obesity or alcohol. In the UK, 40,000 deaths a year are attributable to the effects of poor air quality. During the summer months, cities become heat islands that push air pollution to ever more dangerous levels. This summer has seen reports of increased numbers of people, particularly children, admitted to hospital with breathing difficulties, which many have blamed on air pollution. As we’ve previously reported, in 2017 and 2018, national, regional and city authorities are acting to improve air quality, and around the world urban planners are trying out innovative ideas to combat the heat island effect. Last year, we blogged about Milan’s Bosco Verticale – a ground-breaking project that installed thousands of plants on the balconies of two residential tower blocks. The towers absorb 30 tons of CO2 a year and produce 19 tons of oxygen a day. Noise and heat are also reduced, and the buildings provide habitat for more than 20 species of birds. Another innovative product, Voyager, has been developed by Idox Transport to enable road users to monitor travel information, including air quality and road accidents. The comprehensive travel information system helps drivers avoid congestion hotspots and takes the stress out of planning a journey. One important way of improving urban air quality is to increase the number of trees and plants in towns and cities. But all too often the barriers to tree planting in urban areas can be hard to overcome. Which is why the “City Trees” project is so significant. Designed by a German startup, a City Tree is a “living wall” of irrigated mosses with the pollution-absorbing power of almost 300 trees. A rainwater-collection unit is built into the City Tree, as well as a nutrient tank and irrigation system, allowing the assembly to water itself. There is evidence that green infrastructure can have significant effects on air quality. However, recent studies have indicated that, while vegetation and trees are beneficial for air quality, they cannot be viewed as a solution to the overall problem of poor air quality. That requires a coordinated approach to tackling the causes of air pollution, including diesel emissions from transport. City Trees may not have all the answers to tackling the hidden killers in our air, but they are helping to blunt the impact of air pollution, helping us all to breathe a little more easily. Idox Transport provides a range of products and services to support strategic and localised transport control. Its solutions are designed to ease congestion, improve air quality, detect and manage incidents and promote ‘green wave’ travel. 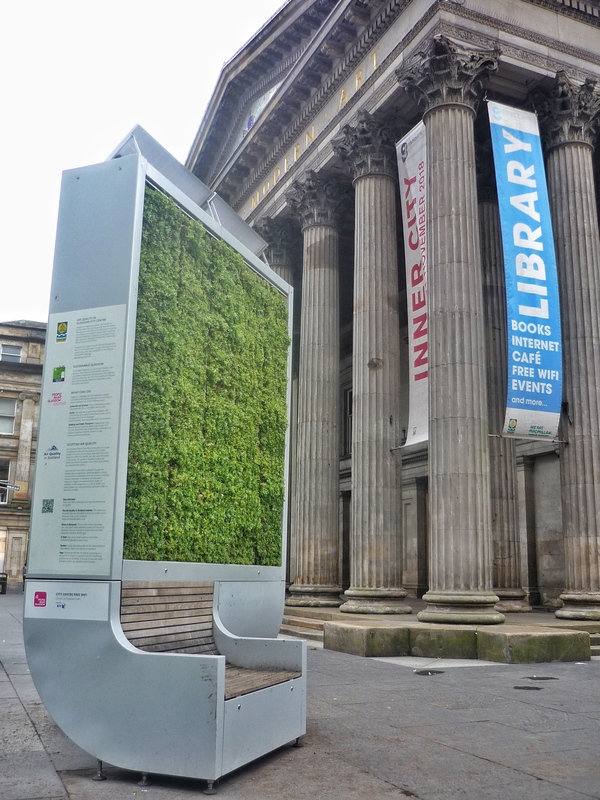 This entry was posted in Environment, Health and social care and tagged air pollution, air quality, cities, City Trees, climate, glasgow, green infrastructure, heat islands, heatwave, London, Newcastle-upon-Tyne. Bookmark the permalink. ← Open access is rapidly rising but is it succeeding?